The main goal of the EURARE project was to set the basis for the development of a European Rare Earth Element (REE) industry. Establishment of an REE value chain in Europe would safeguard the uninterrupted supply of REE raw materials and products crucial for sectors of the EU economy (including automotive, electronics, machinery and chemicals) in a sustainable, economically viable and environmentally friendly way. 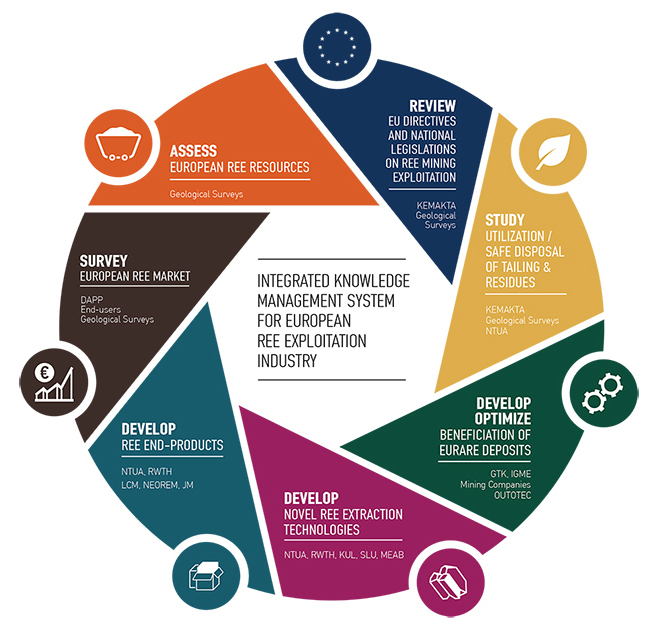 Integrated knowledge management system for European REE exploitation industry. The development of an Integrated Knowledge Management System (IKMS) for EU REE resources, which will provide information on REE and build up the knowledge to be developed within the frame of the project. Definition and assessment of exploitable REE mineral resources and REE demand in Europe. Development of sustainable and efficient REE Ore Beneficiation Technologies, that will lead to the production of high grade REE concentrates and minimization of produced tailings. Development of sustainable REE Extraction and Refining Technologies, to produce pure REE oxides, REE metals and REE alloys suitable for use in downstream industries. The development of a strategy for safe REE mining and processing. Field Demonstration of the novel EURARE REE exploitation technologies. Identification of novel sustainable exploitation schema for Europe's REE deposits. The EURARE project was co-funded by the European Commission (EC) under the 2012 Cooperation Work Programme for Nanotechnologies, Materials and new Production Technologies and specifically the raw materials topic NMP.2012.4.1-1 "New environmentally friendly approaches in minerals processing". The project began on the 1st of January 2013, and will run for five years. It has a 13,845,950 EUR total budget of which up to 9,000,000 EUR may be funded by the EC.